Maximize musical ideas on-stage or in the studio with the new Akai MPK49 performance controller. Maximize musical ideas on-stage or in the studio with the new Akai MPK49 performance controller. The Akai MPK49 ushers in a new era for USB/MIDI controllers by combining a high-quality, 49-key, semi-weighted keyboard with aftertouch and 12 genuine MPC drum pads. 48 total pads are accessible via 4 pad banks. The pads feature the heart and soul of hip hop: the MPC Note Repeat function and Swing parameters. The Akai MPK49 Performance Controller also has its own arpeggiator, for creating quick, creative riffs in seconds. 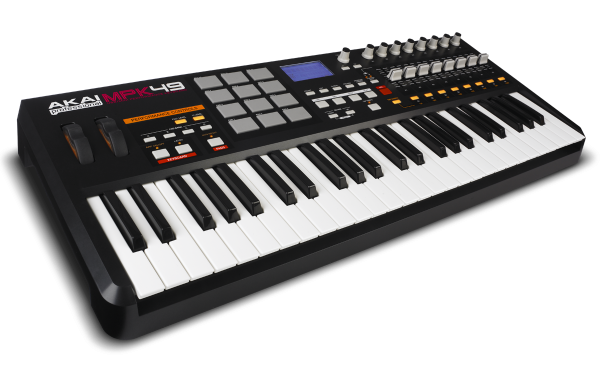 The Akai MPK49 features MPC 'Full Level' and '12 Levels' functions on its pads, and MPC Swing can be applied to both Note Repeat and Arpeggio functions. Tap Tempo and time-division buttons allow for real-time control of Note Repeat and Arpeggio clock speeds. The Akai MPK49 delivers an amazing 76 assignable controls, with assignable inputs that include an expression pedal, footswitch, pitch bend and modulation wheel.